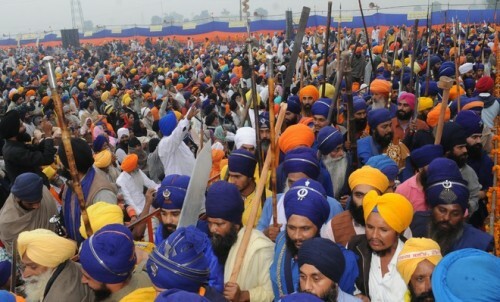 Sarbat Khalsa’s purpose is to strengthen all Sikhs institutions and traditions. 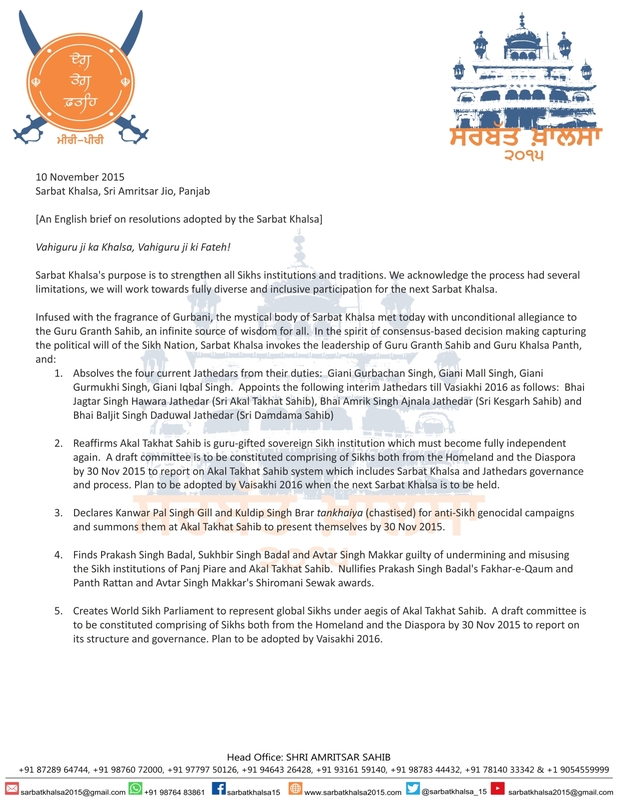 We acknowledge the process had several limitations, we will work towards fully diverse and inclusive participation for the next Sarbat Khalsa. Reaffirms Akal Takht Sahib is guru-gifted sovereign Sikh institution which must become fully independent again. A draft committee is to be constituted comprising of Sikhs both from the Homeland and the Diaspora by 30 Nov 2015 to report on Akal Takht Sahib System which includes Sarbat Khalsa and Jathedars goverance and process. Plan to be adopted by Vaisakhi 2016 when the next Sarbat Khalsa is to be held. 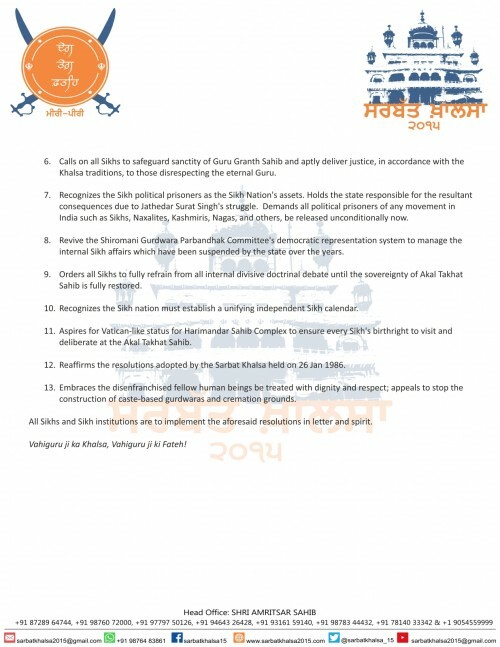 Declares Kanwar Pal Singh Gill and Kuldip Singh Brar tankhaiya (chastised) for anti-Sikh genocidal campaigns and summons them at Akal Takht Sahib to present themselves by 30 Nov 2015. Finds Prakash Singh Badal, Sukhbir Singh Badal and Avtar Singh Makkar guilty of undermining and misusing the Sikh institutions of Panj Piare ad Akal Takht Sahib. Nullifies Prakash Singh Badal’s Fakhar-e-Qaum and Panth Rattan and Avtar Singh Makkar’s Shiromoni Sewak awards. Creates World Sikh Parliament to represent global Sikhs under aegis of Akal Takht Sahib. A draft committee is to be constituted comprising of Sikhs both from the Homeland and the Diaspora by 30 Nov 2015 to report on its structure and governance. Plan to be adopted by Vaisakhi 2016. Calls on all Sikhs to safeguard sanctity of Guru Granth Sahib and aptly deliver justice, in accordance with the Khalsa traditions, to those disrespecting the eternal Guru. Recognizes the Sikh political prisoners as the Sikh Nation’s assets. Holds the state responsible for the resultant consequences due to Jathedar Surat Singh’s struggle. Demands all political prisoners of any movement in India such as Sikhs, Naxalites, Kashmiris, Nagas, and others, be released unconditionally now. Revive the Shiromani Gurdwara Parbandhak Committee’s democratic representation system to manage the internal Sikh affairs which have been suspended by the state over the years. Orders all Sikhs to fully refrain from all internal divisive doctrinal debate until the sovereignty of Akal Takht Sahib is fully restored. Recognizes the Sikh nation must establish a unifying independent Sikh calendar. Aspires for Vatican-like status for Harimandar Sahib Complex to ensure every Sikh’s birthright to visit and deliberate at the Akal Takht Sahib. Reaffirms the resolutions adopted by the Sarbat Khalsa held on 26 Jan 1986. Embraces the disenfranchised fellow human beings to be treated with dignity and respect; appeals to stop the construction of caste-based gurdwaras and cremation grounds. All Sikhs and Sikh institutions are to be implemented the aforesaid resolutions in letter and spirit.